Something is going to happen that hasn’t happened all this campaign season on Thursday. 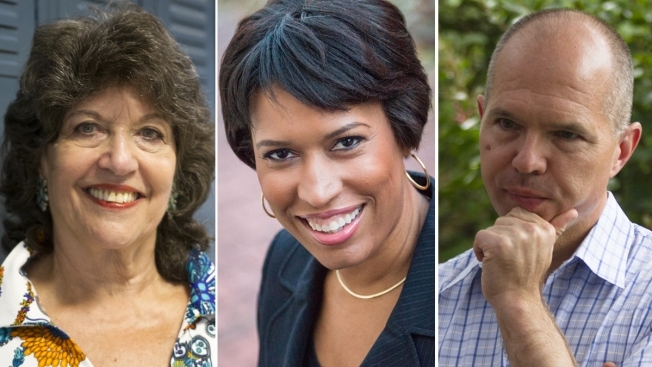 Mayoral candidates Carol Schwartz, David Catania and Muriel Bowser finally — some would say at last — will be on the same stage at the same time taking media and voter questions. But don’t get used to it. The candidate conversation Thursday night at the American University’s Katzen Arts Center is just one of four that Democratic nominee Bowser is agreeing to do. As recently as this week, her campaign declined to give any indication she might do more. That’s bad news for some significant community groups that traditionally run candidates through a wringer of debates. For example, the age-old Federation of Civic Associations and the Federation of Citizens Associations together represent about 75 neighborhood organizations. For more than four months they’ve been planning a forum for Oct. 21 at Eastern High School. Catania said yes. Schwartz said yes. Bowser’s campaign hasn’t said anything. In Southwest, community leaders like Andy Litsky are hosting a Southwest/Southeast mayoral debate Oct. 9 at Arena Stage. Participating groups include Advisory Neighborhood Commission 6D, the longtime Southwest Neighborhood Assembly and the Navy Yard Neighborhood Association. Schwartz said yes. Catania said yes. Bowser? The Catania and Schwartz campaigns said they also have invites from the Committee of 100 on the Federal City, anchor Bruce Johnson at WUSA-TV Channel 9, the Washington City Paper, the local AARP chapter and others. Joaquin McPeek, Bowser’s press person, said Bowser stands by her Sept. 12 announcement on forums. In addition to American University on Thursday, Bowser has accepted the Oct. 2 debate being hosted by WAMU’s Kojo Nnamdi at National Public Radio on North Capitol Street. Bowser also agreed to the NBC4/Washington Post forum to be held Oct. 15 (and broadcast later by NBC4) and the Oct. 16 Ward 8 Collaborative Forum sponsored by 35 community groups. Nearly every candidate for public office – especially for mayor — has groused at least a little bit about the wearying, dizzying pace of multiple forums, Bowser included. The marathon of events to win the April 1 Democratic Primary wasn’t that long ago. She’s now doing small-scale events every day, and her campaign says she’s meeting voters one-on-one all the time. Attending the forums is not seen as a necessarily efficient use of her time. Her critics say Bowser isn’t good in debates and is making a campaign gamble that voters won’t care enough about her absences to affect the outcome. Schwartz is making her fifth run for mayor and is a veteran of citywide council races. Catania, who released a 126-page platform of ideas and issues on Monday, said voters need more from unsheltered candidates. “There’s simply no way that voters are going to be able to come away after four debates with an understanding of what me and my opponents would like to do as mayor,” Catania said. ■ Statehood fantasy. If you’re tired of fantasy football, you can start a new game of fantasy statehood. U.S. Sen. Tom Carper, D-Del., held a well-attended hearing on D.C. statehood Monday. Well, it was well-attended by citizens. Not many senators show up on Mondays or Fridays on Capitol Hill. And certainly not for D.C. statehood. Carper gave an impassioned opening statement in favor of full American citizenship for D.C. residents. But just to be clear, there is no plan to bring the statehood issue to a vote in committee or, even less likely, on the Senate floor. And after November’s elections, the Democrats may lose control of the Senate to Republicans. ■ Food for thought. The DC Central Kitchen, which does hard-core work to help feed the neediest among us, is holding a fundraiser Thursday. It’s at 6 p.m. at the Liaison Capitol Hill Rooftop Pool & Bar, 415 New Jersey Ave. NW. The heartfelt story is told by Alexander Justice Moore, the kitchen’s chief development officer. It tells the story of Robert Egger, “the cocky nightclub manager” who opened the kitchen and changed the face of poverty assistance in Washington. It’s a good read to pick up even if you can’t make the party.